Is Your Smile a Garden? At Abilene Family Dentistry, we have the technology, experience, and compassionate touch necessary to prevent the cascade effect that can be caused by just one missing tooth. We can restore your oral health, improve your self-esteem, and get you back to eating, laughing, and smiling confidently with the #1 dentist- and patient-recommended solution. Dental implants are small posts made of biocompatible titanium that are surgically placed into your jawbone to replace your tooth’s root. Replacing the roots of missing teeth keeps your jawbone strong and gives you the most natural-looking and feeling tooth replacement solution dentistry has to offer. Implant dentistry is a continuously evolving practice because dentists want to be able to provide a comfortable, permanent, and beautiful solution for every smile. There’s even a way to reverse jawbone atrophy, which is important for successful implantation. With procedures like bone grafting and techniques like inserting implants at different angles, it’s a replacement option that can be customized to meet your individual needs and goals. 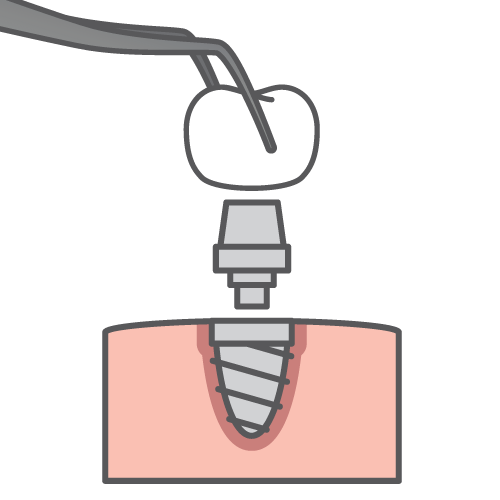 Implants can replace one missing tooth or several. 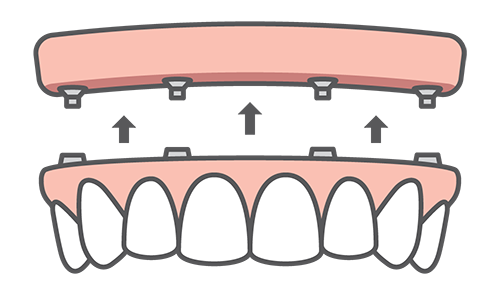 Implants blend in with remaining natural teeth. Eat your favorite foods without fear of teeth slipping. Your jawbone will stay firm and preserve facial aesthetics. Maintain or improve your speech patterns. Implants look and feel natural and can last a lifetime. If you recently suffered the loss of your natural teeth, we want you to know you’re not alone. In fact, 36 million Americans are edentulous (living without any natural teeth). If you’ve replaced them with dentures, but the dentures aren’t as comfortable or secure as you were hoping for, we have solutions for you, too. Depending on your unique needs, we can place a series of implants to secure a full arch of teeth that looks, feels, and functions just like your natural teeth. We can help you put messy adhesives and the fear of your dentures slipping in the past where they belong. Implant-supported dentures can get you back to eating your favorite foods, speaking comfortably, and smiling confidently. Tooth loss can be traumatic, but replacing them doesn’t have to be with dental implants! If you’ve read everything before reaching this section, we’re sure you can see why dental implants are the highest recommended tooth replacement option. They look, feel, and function like natural teeth, they prevent a host of issues that negatively impact your oral and overall health, and perhaps most importantly, they’re a lifelong solution. Caring for your implants the way you would care for natural teeth can ensure their health and strength for decades to come. If you have any questions about dental implants or you’re ready to schedule a consultation with your Abilene implant dentists, Dr. Webb and Dr. Awtrey, give us a call today or request an appointment online. We look forward to improving your smile and quality of life!